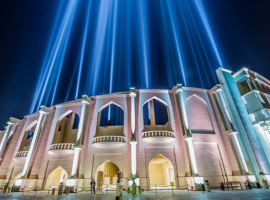 The Katara Amphitheatre was transformed into a chalice of light and sound, while the heavens above the Katara Village in Doha, Qatar, were flooded with blazing beams of light. 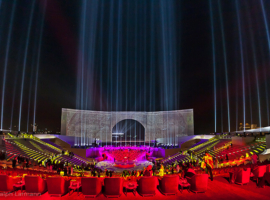 For the ceremonial opening of the Katara Amphitheatre, under the patronage of His Highness Emir Sheikh Hamad bin Khalifa Al Than, on the occasion of the Fourth Forum of the Alliance of Civilizations, AO Creative implemented a spectacular light show by star lighting architect Gert Hof for the concert by the Oscar-winning Greek composer Vangelis that brought the entertainment to a triumphant conclusion. The master of ceremonies for the event, which was attended by an array of dignitaries, headed by His Highness the Emir of Qatar, the royal family of Qatar, and a number of international ministers, was the British actor Jeremy Irons. Commissioned by Universal, the event posed a formidable challenge to the German-based service provider AO Lighting, which was responsible as general contractor for the lighting and pyrotechnics including the provision of electrical power, control and programming for the light show. The latter was realized by AO Creative directed by light architect Gert Hof. Only ten days had been assigned to put together a multimedia show in which at times over 350 high-powered searchlights, a variety of lighting systems, fireworks and video projection were employed simultaneously. A variety of dhows and two historic sailing ships, all brilliantly illuminated, were also integrated into the show. 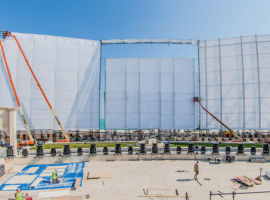 The central section of the giant screen erected on the seaward side of the amphitheatre formed a giant arch that opened to reveal not only the sailing vessels out in the Persian Gulf but also a giant barge armed with no fewer than 90 xenon searchlights to create a blazing island of light in the ocean. Whilst the audience listened with rapt attention to the concert pieces and arias, a murmur went through the ranks as Gert Hof’s light show began. 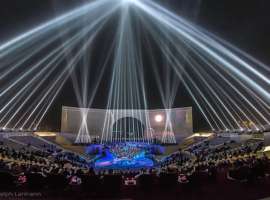 This so excited the curiosity even of those visitors who had retreated to the indoor comfort of the Katara Village during the earlier part of the concert on account of the cold weather that they re-emerged and packed the theatre to witness with enthusiasm the choreography of light. The light show, accompanying Vangelis’s famous scores for Chariots of Fire and Conquest of Paradise that marked the climax of the opening ceremony, was devised by star lighting architect Gert Hof of Berlin, who worked closely with the composer and musical director, Vangelis, on the project. Some of the music, for which around 500 performers were engaged, was composed by Vangelis especially for this show, the motto for which was ‚Peace and Hope‘. Scenic elements on the Persian Gulf Two rows of xenon searchlights were superposed on a barge just under 90 metres long and aimed towards the amphitheatre. The control of these devices was realized from a distance of 611 metres over three Universe systems via wireless DMX and an MA control desk. 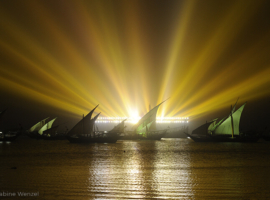 The dhow sailing ships were illuminated by HQI searchlights and Bengal fireworks. The topmost row of the amphitheatre was furnished with FALCON xenon searchlights. These formed a framing element of the light show. In the stage area, in front of the hydraulic-powered gateway to the sea, the high-powered searchlights were arranged to form two rings of light flanking the gate and a gently curved curtain of light. Whilst the arch was formed by FALCON BEAM 7000W and FALCON 6000 CMY luminaires, each of the rings was composed of FALCON xenon searchlights (FALCON BEAM 3000W and 7000W as well as FALCON 6000 CMY). With these constellations, Gert Hof was able to create a harmonious, flowing progression of lighting images. 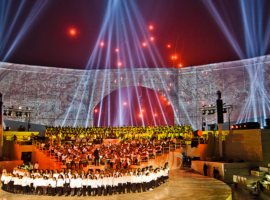 As a result of this production, the Katara Amphitheatre made a dazzling first impression on its international audience. 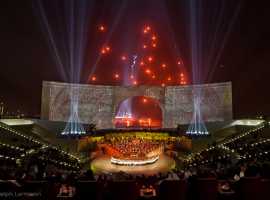 Many star acts, including Vangelis, the Qatar Philharmonic Orchestra, the Yurlov Russian State Academic Choir, the soprano Angela Gheorghiu, the tenor Roberto Alagna and the Qatar Philharmonic Children’s Choir were part of the show in the largest amphitheater in the Middle East.